NASA’s Mars Atmosphere and Volatile Evolution (MAVEN) space probe thundered to space on Nov. 18 following a flawless blastoff from Cape Canaveral Air Force Station’s Space Launch Complex 41 at 1:28 p.m. EST atop a powerful Atlas V 401 rocket. “Hey Guys we’re going to Mars!” gushed Bruce Jakosky, MAVEN’s Principal Investigator at a post launch briefing for reporters at the Kennedy Space Center. The absolutely perfect countdown culminated in a spectacular on time lift off that rumbled across the Florida Space Coast to the delight of cheering crowds assembled for the historic launch aimed at discovering the history of water and habitability stretching back over billions of years on Mars. The $671 Million MAVEN spacecraft separated from the Atlas Centaur upper stage some 52 minutes after liftoff, unfurled its wing like solar panels to produce life giving power and thus began a 10 month interplanetary voyage to the Red Planet. “We’re currently about 14,000 miles away from Earth and heading out to the Red Planet right now,” said MAVEN Project Manager David Mitchell of NASA’s Goddard Space Flight Center at the post launch briefing, after the 5,400-pound spacecraft had been soaring through space for barely two and a half hours. It will take the spacecraft 10 months to reach the Red Planet, with arrival scheduled for Sept. 22, 2014. Jakosky noted that while the launch is a big milestone, it’s just the beginning. 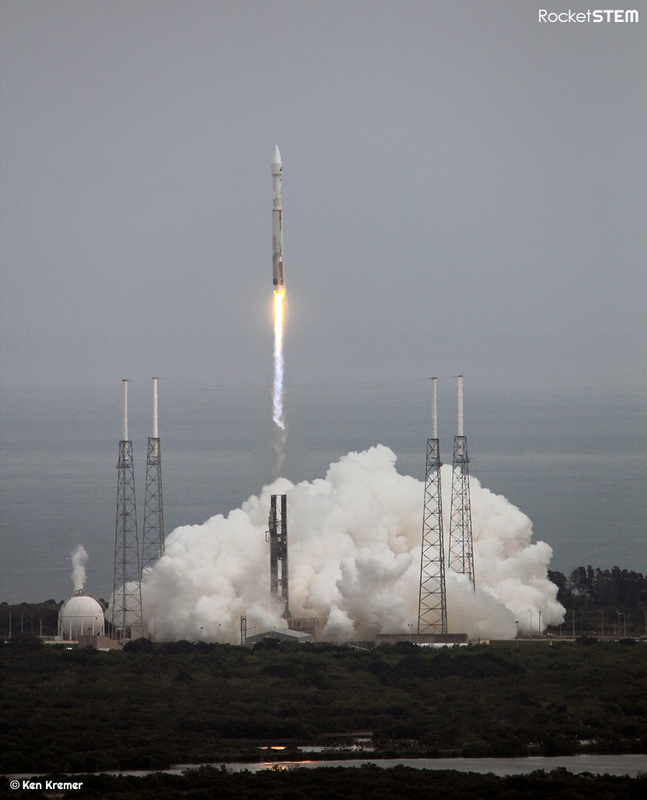 MAVEN’s purpose is to accomplish world class science. After arriving at Mars and completing a check-out period it can finally begin collecting science data. The orbiter will answer key questions about the evolution of Mars, its geology and the potential for the evolution of life. MAVEN will study Mars upper atmosphere to explore how the Red Planet may have lost its atmosphere over billions of years. It will measure current rates of atmospheric loss to determine how and when Mars lost its atmosphere and water. “Safe travels MAVEN! 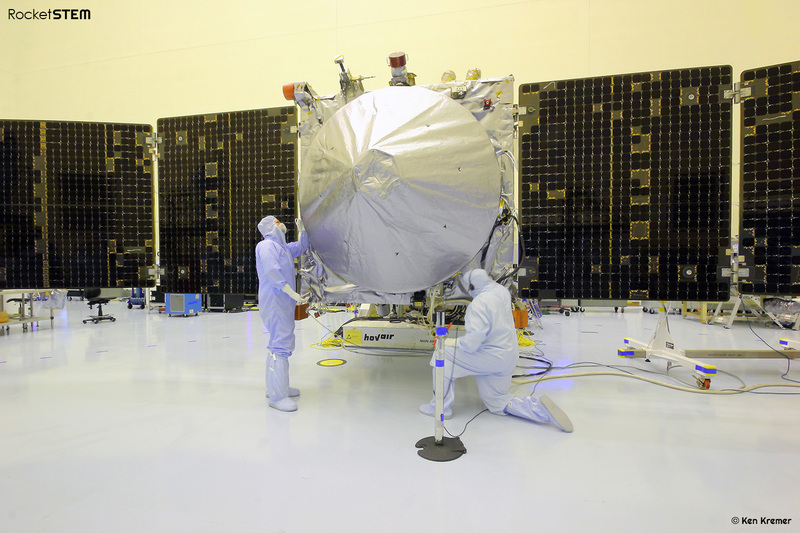 We’re with you all the way.”The MAVEN probe carries nine sensors in three instrument suites. The Particles and Fields Package, provided by the University of California at Berkeley with support from CU/LASP and NASA’s Goddard Space Flight Center in Greenbelt, Md., contains six instruments to characterize the solar wind and the ionosphere of Mars. The Remote Sensing Package, built by CU/LASP, will determine global characteristics of the upper atmosphere and ionosphere. The Neutral Gas and Ion Mass Spectrometer, built by Goddard, will measure the composition of Mars’ upper atmosphere. “We need to know everything we can before we can send people to Mars,” said Dr. Jim Green, NASA’s Director of Planetary Science at NASA HQ in Washington, DC. Over the course of its one-Earth-year primary mission, MAVEN will observe all of Mars’ latitudes at altitudes ranging from 93 miles to more than 3,800 miles. Five deep dip maneuvers will be executed during the first year, descending to an altitude of 78 miles. This marks the lower boundary of the planet’s upper atmosphere. NASA’s MAVEN orbiter and India’s MOM (Mars Orbiter Mission) will “work together” to help solve the mysteries of Mars atmosphere, Jakosky told me.